Welcome to longest-running tennis parties, since June 1979! We are known for our friendly, yet competitive matches on the courts and the relaxed and congenial atmosphere off the courts. Think of it as Tennis With a Social Spin! Meet other tennis enthusiasts from all levels of play, for fun and yet competitive matches. It was more than a tournament.... I first started running Sunday tennis parties at Packanack Lake Tennis Club in the Summer of 2007 and immediately fell in love with it. The small community feel and the laid-back lake residents' welcome made me feel so at home. Then one day in summer 2011, I called upon a player to fill in for a party at the lake because someone told me he lived right next to the courts. I was in awe by the way he gracefully and flawlessly played, though I didn't know who he was at the time. A few months later I found out that he is the son of the man, who built Packanack Lake Tennis Club. The big sign on the door with the letters "J.K. Hughes" all started to make sense. Alan Hughes started playing tennis when he was 7 years old and helping hose down the clay courts. By the age of 11, his dad put him to work, rolling the courts by hand, as he was not old enough yet to use the tractor. He learned everything hands on. He competed professionally and taught some of the best players, including Carolyn Stoll, who became #15 in the world. 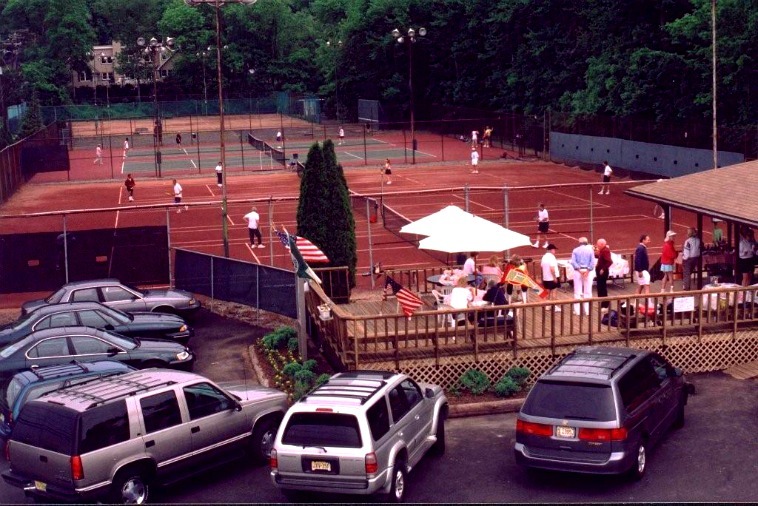 In 2011 Hurricane Irene destroyed 3 of the 6 clay courts. The club could not afford the enormous cost of repairs. Naturally there was only one thing to do, Alan took on the challenge to re-build from scratch in his spare time after work, starting in the spring of 2012 to its completion in the early fall of 2012. Currently these courts are in the best condition they have ever been, some of the nicest in Northern New Jersey. They will only get better with time, as the new clay settles. When there was a need to raise money for repair costs, I didn't hesitate to hold tournament fundraisers. When there was a need for more male players for the mixed doubles tournament last Saturday, September 28, 2013, I didn't hesitate to invite Alan. It was an opportunity to watch a legend, an icon, play on one of the nicest clay courts in Northern New Jersey, the ones his father built, the ones he re-built. It was an opportunity and an honor to see the pride and the legacy be carried on. It was more than a tournament. We have numerous match parties all week and weekend long, serving the Tri-State area: NY, NJ & CT. View our numerous locations and discover our weekly schedule and get out there & play! We have several opportunities to play during the week. Tennis Buffs has parties in 2015 from Tuesday through Sunday. Make your reservation days, weeks or months in advance with our handy reservation calendar.